As is the tradition of culture creation, deviant behavior and boundary pushers are the ones who inspire the biggest mainstream trends. This article gives us a bit of context into the inspiration for Punk Rock attire and a great explanation as to why it took off. The fact of the matter is – clothing is the most visible way for any group of people who share a belief or culture to both identify with one another as well as communicate in shorthand to the “others”. As far as Punk Rock goes, the biggest statement the Punk movement made, in equal vociferousness with their music, was their uniform. And to be clear, even though it’s purpose was a juxtaposition to the mainstream, the very specific guidelines for disheveledness and through-the-ringer destructive detail are the definition of a “look” and consequently a uniform – in the same way that hip hop, grunge and hipsters all have a uniform. 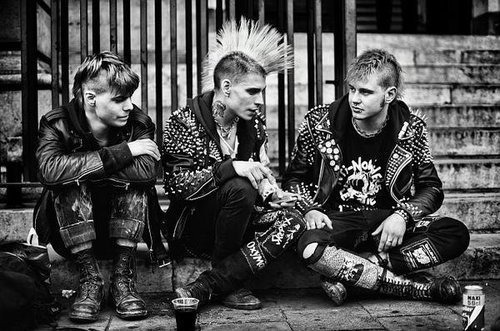 There are a number of sociocultural reasons why Punk managed to create such a stir and maintain such an impact. At the heart of it, however, is the concept of deviance. Punk was an extreme deviation at a time when the developed world was grasping on to the golden ladder-rungs of a mainstream middle class ideal. Most punk rockers will tell you that the exhibit at The Met is a Devil-Wears-Prada rip off of authentic angst. But if you really think about the role of high fashion as art – it’s about the appreciation of human culture’s influence on how we present ourselves to the world. Granted, couture culture is filled with many whose eccentric personas and big bank accounts separate them from the “uncivilized” masses – but I find that kind of Deviance just as intriguing – the influence that comes with granting artists access defined by traditional monetary means. It’s one of the things I love about high art – that it’s an exercise in irony. It’s one of those conversations on the spiral of social dynamics that inspires both the trends and counter-trends that move us forward. Next ›Surviving and Thriving: and its Socital Differences.